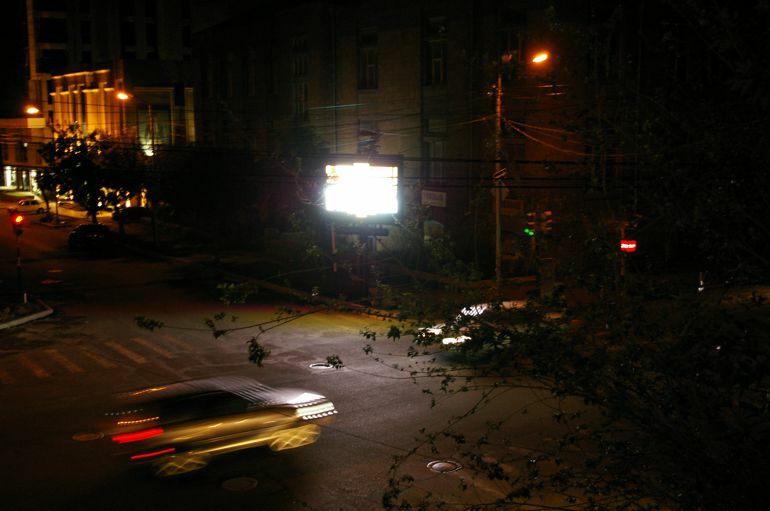 Yerevan’s Digital Billboards – Are They Really Necessary? 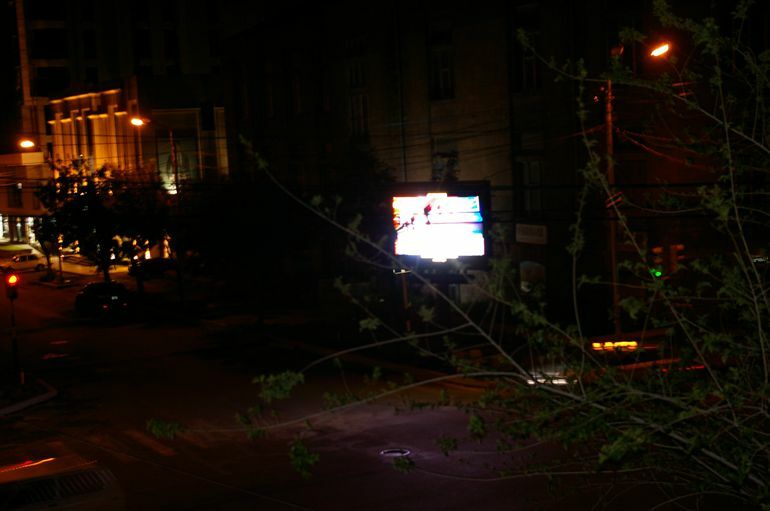 About six weeks ago a mounting stand for a digital billboard was fixed on the corner directly across the building in which I live adjacent to the printing house, at the intersection of Vartanants and Hanrapetutyan Streets. It was supposed to be installed across the street but someone came by and complained that it would block their windows, and remarkably whoever was in charge listened, then they hauled the thing away. Last week the LED screens were installed, and yesterday the blinding advertisements for luxury ski resorts, casinos and expensive furniture stores began, in the heart of a middle-class neighborhood. I have become so numb to such buffoonery that I’m not even trying to understand the logic in installing this billboard and others like it in the first place. But I wanted to get an estimate for what such a billboard would ordinarily cost and I found a web site that provides instant quotes. I’m not very good with guessing measurements but to my eyes the billboard measures about 3 x 3 meters. The screen seems to be high-resolution, judging from the picture quality and brightness, which brings the price at around $18,600. The stand seems to be constructed of some heavy duty metal, perhaps iron–the site estimates it to cost around $11,800. Then there’s shipping and installation to take into consideration, about $800 and $1800, respectively. At 7 cents per kilowatt, the current price of electricity that is scheduled to increase incidentally, the monthly operational cost is just over $103. Altogether, including other fees such as connectivity, the total expenditure comes to around $56,640, and again, this is according to the data that I fed into the calculator, it’s not meant to be an accurate figure. 1. Subsidize low income housing for two newlywed couples. In more remote parts of the city like Sepastia, Nor Nork or even Avan, Soviet-era apartments could be found for $25,000, maybe even less. Give them another few thousand to furnish the place properly and inspire them to be good citizens in the process. Or, find housing for families living in crammed quarters like sardines in the Erebuni hostels. The homeless, naturally, could also benefit from proper living conditions and mental rehabilitation. 2. Renovate one or two schools in dire need of repairs, especially in rural areas of Armenia far from the capital. Many still have broken windows, improper heating, dysfunctional lavatories. State-subsidized hospitals are also in need of funds–the shabby, unhygienic maternity ward where my child was born in Zeytun comes immediately to mind. 3. Build additional playgrounds, especially soccer fields, and thereby encourage children to be more active in playing sports. While your at it, might as well start a physical education campaign to get kids off their asses and exercise properly. 4. Increase the wages of the invisible street sweepers who are out there at 4 o’clock in the morning each day. Who knows what they make–it can’t be much more than a hundred bucks a month, realistically half that. 5. Install new, clean public toilets, especially in areas heavily frequented by tourists, like Republic Square and the Vernisage. If Armenia aspires to be European, it needs to act like it and properly cater to so many of its guests from Italy, France, etc. The list goes on. I could sit here all night and think of more useful ways to spend that fifty grand, and I’m sure anyone reading this will have some other useful suggestion in mind. Installing digital billboards is not the answer to demonstrating progress. It comes from smaller, tangible things that are not easily noticed but make a huge impact on the community. That’s how society expands and transforms. Twenty years ago when Armenia declared itself independent from Soviet rule it was not only claiming statehood, it was calling for a restoration of values. The Armenian people would be able to think and create freely in a fledgling democracy that was both naïve yet highly optimistic. Many people believed that prosperity was on the horizon, jobs would be created, and a bright future awaited them. Little did they know that both war and unchecked entrepreneurship would set them back several years. Some have never seen any kind of prosperity after independence, whether financial or spiritual. Promote small business. 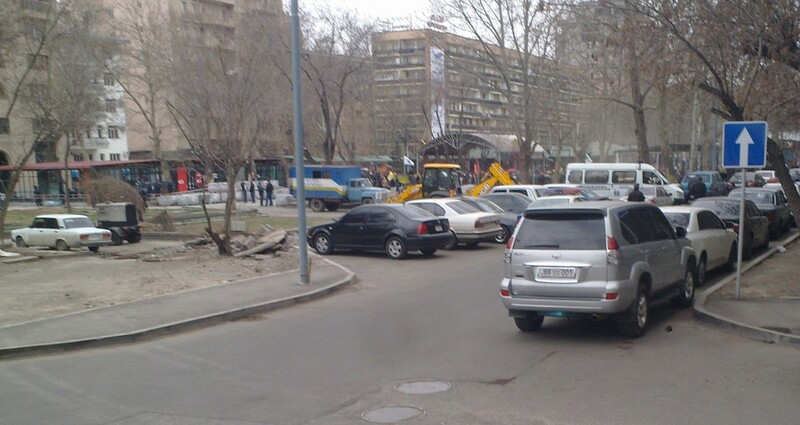 Yerevan mayor Karen Karapetyan made himself public enemy by sweeping traders off the streets (oddly only florists are allowed to sell roses from sidewalk stands) and destroying inconspicuous kiosks where cobblers, tailors, and cigarette sellers set up shop. Shopkeepers are harassed by taxmen and some are even forced to close for days on end while they scramble to clear up minute discrepancies found as a result of loopholes purposely left open by the tax authorities to extort bribes. Although Prime Minister Tigran Sarkisian has often talked about encouraging the growth of small businesses, he has been reluctant to disclose the details of policies his government plans to implement. Tax breaks coupled with guaranteed interest-free government loans would encourage small businesses to open and help nurture an environment of trust. Prevent emigration and promote immigration. 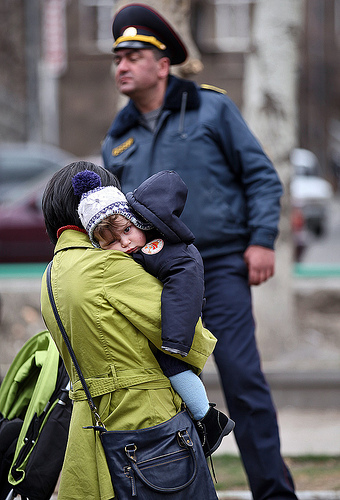 President Sarkisian desperately needs to draft a plan for slowing down the exodus from Armenia. That should include job creation through promoting foreign investment in the manufacturing and IT sectors, an increase in the minimum wage, and equal opportunity, particularly in government agencies. He also needs to address the relatively low birthrate, with 12 children born for every 1,000 people and on average one child born per household, according to 2011 figures. He also needs to ensure that infrastructure is modernized even in the most remote villages of the republic. Several areas of Artsakh along with the Armenian controlled territories surrounding it must be populated, and that again can only come about with increased investment and the vital infrastructure in place. 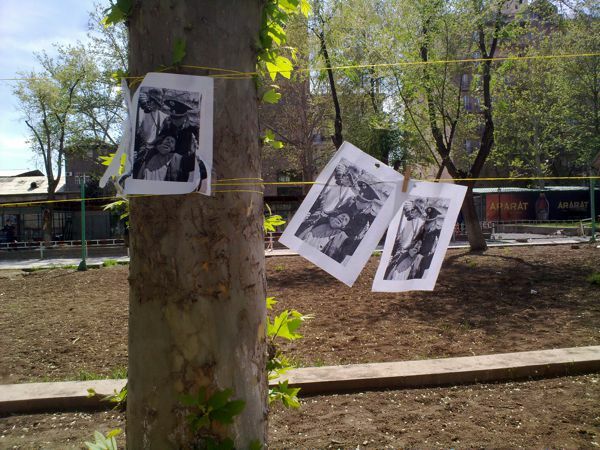 When Armenians worldwide feel confident that the Armenian government is able to provide the means and conditions for promoting growth throughout the regions, they will begin to immigrate. 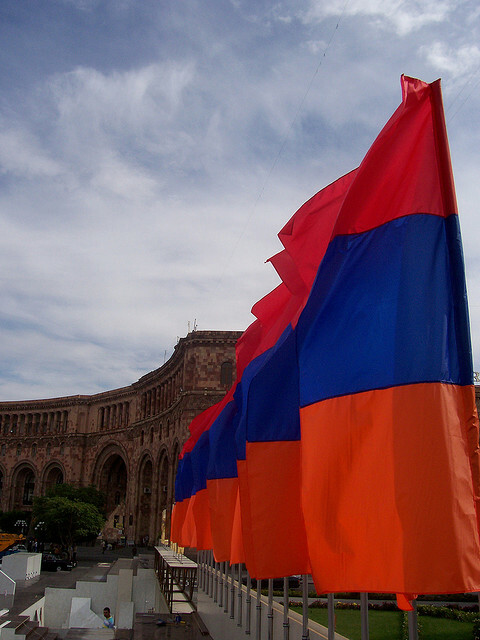 These are only a handful of issues that loom over Armenia’s destiny. There are just as many if not more challenges related to Armenian foreign policy that must be addressed, the most important being the resolution of the Nagorno-Karabakh conflict, which seems to be floating in an eternal stalemate. My wife, baby and I just returned from Mashdots park where we learned that the controversial kiosks that were partially erected and were the source of contention for about two months now will apparently be dismantled. Earlier in the day President Serge Sarkisian went to the park with Yerevan Mayor Daron Markarian. After surveying the scene he ordered Markarian to have the structures torn down. 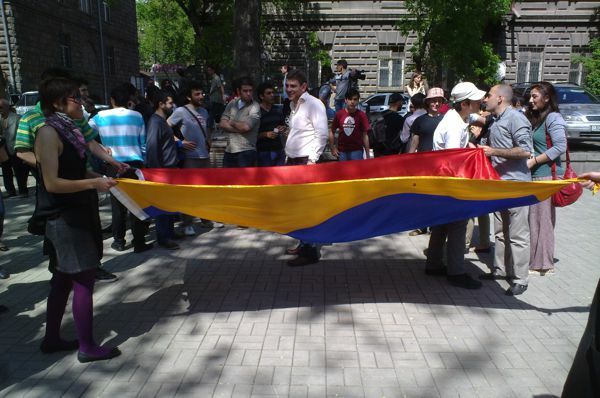 This is a huge victory for civil society in Armenia. Kudos to all the protesters who day after day stood up for what they believed in and for the rights of all Armenian citizens. But isn’t there more to it? The National Assembly elections are right around the corner and the President’s Republicans need all the legitimate votes that they can get. Plus it’s excellent PR for the president since the city is filled with elections observers and essentially the eyes of all democratic nations are on Armenia now. 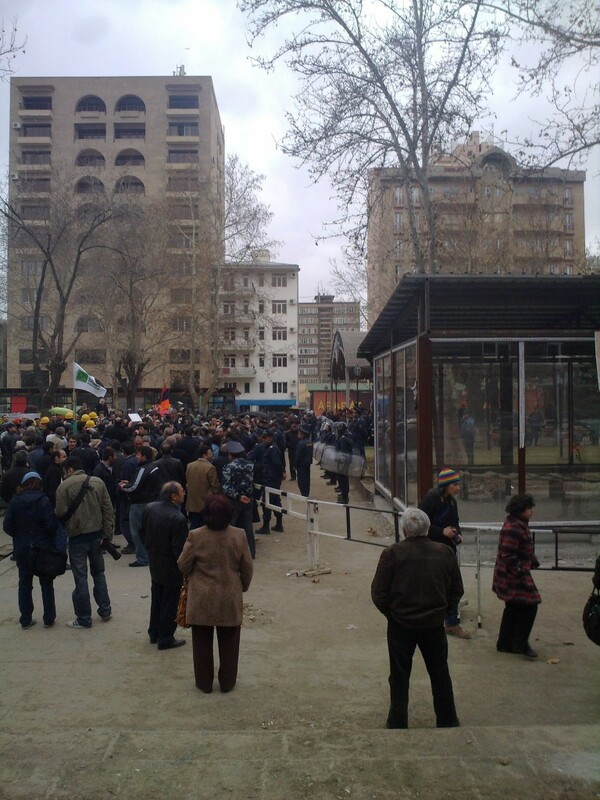 Not to mention that the standoff had become a huge embarrassment for the Armenian government. 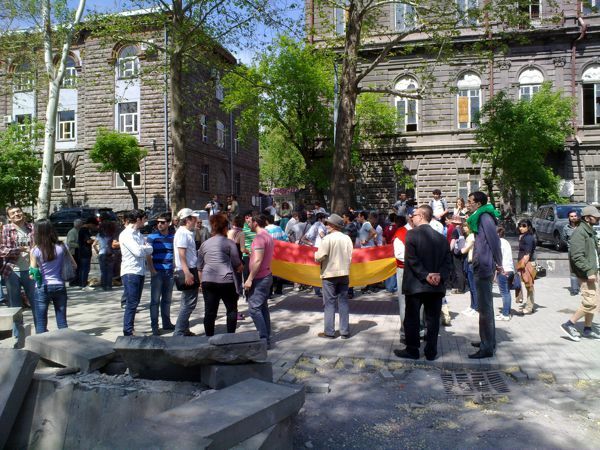 On April 29 seven people were detained by police after a melee ensued over some of the protesters’ desire to pitch a tent on the park, the highlights of which have been posted on YouTube by various sources. This decision also signals a rift between the president and Prime Minister Tigran Sarkisian who was adamant about leaving the structures there, promising that they would be removed in three years time, which of course means that they would have remained indefinitely. The refusal to back off also became a “matter of principle,” meaning the PM wasn’t about to let a bunch of kids tell him what to do. Regardless, had there been no protests the kiosks would have been operational and there would not have been any need for any official to demand that they be removed. 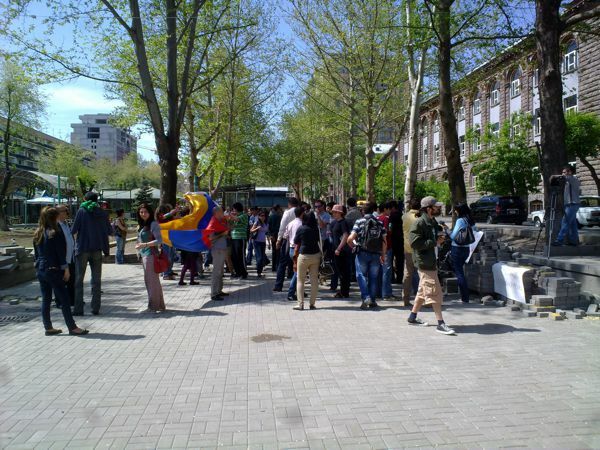 The victory of the Save Mashdots Park movement is yet further proof that if you persist long enough, you can change things in Armenia. The problem is that there are too many pessimists here in society setting a defeatist tone, and most don’t even attempt to change anything they disagree with thinking it is futile to lift a finger against the establishment. The complaint that “you can’t do it” (or ches gara as some defiantly say here) is sounding more and more like a pathetic joke. Now, what’s next on the agenda? 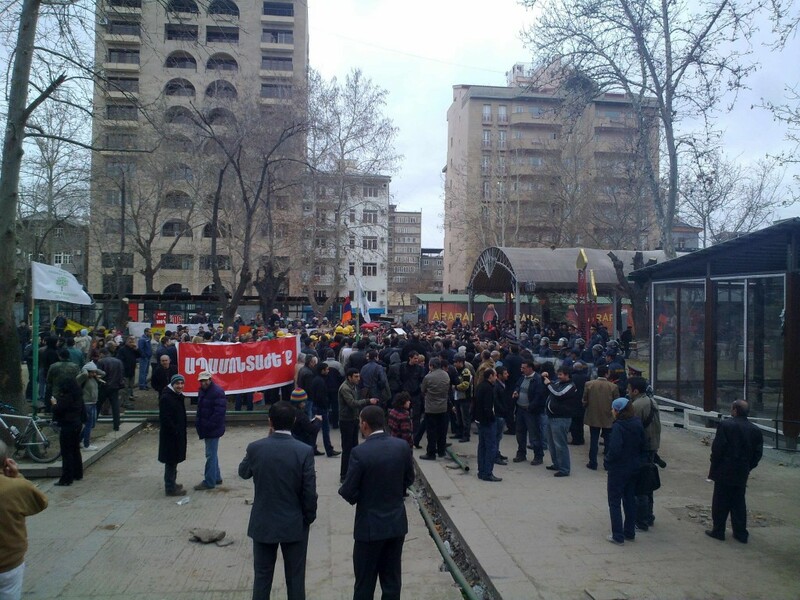 These are some photos from this afternoon’s protest at Mashdots Park in Yerevan. The area was chaotic — on the far end of the park there was a backhoe digging up the sidewalk, making a tremendous amount of noise and polluting the air with exhaust fumes and dust. Today a group of about 10 people wearing yellow hard-hats, tools in hand, decided to show up in the hopes of dismantling the rows of kiosks. There were dozens of police on hand to face the peaceful protesters, even some in full riot gear which I thought was over the top. 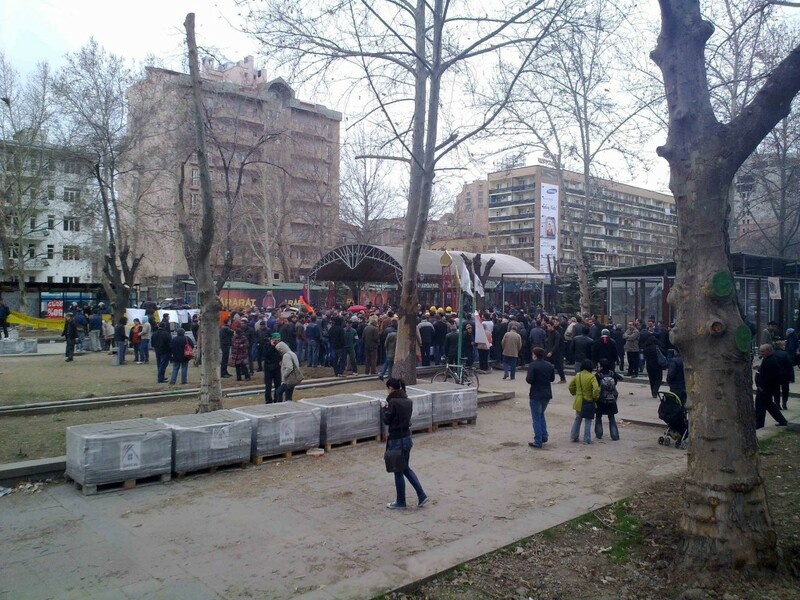 A news site called Asparez was streaming video of the protest live. I couldn’t help thinking how absurd this whole affair is. 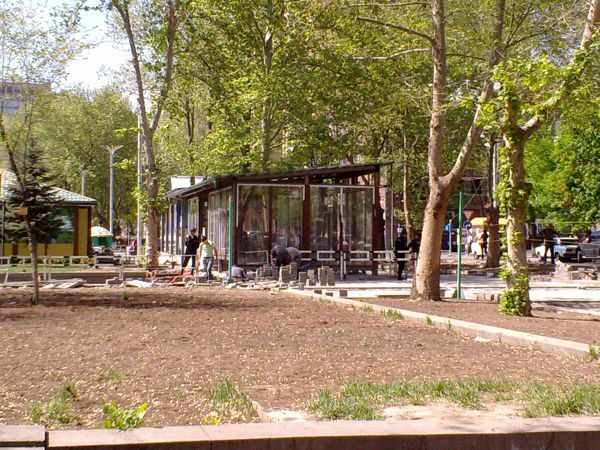 The Yerevan municipality decided to contradict its very own law that it put into force last year banning these kiosks from existing on sidewalks in the first place. Then these activists keep returning day after day hoping to somehow take the park back on behalf of the public. In the meantime, none of the political parties are taking advantage of the opportunity to win votes in the coming parliamentary elections by lending their support. The confrontations with the police are a bit pointless because they’re just doing their jobs — defending the position of the authorities. The protesters should realistically be taking up their beef with the city mayor and the Prime Minister, both of whom continue to be inconspicuously absent at each of these events. If you want to legitimately address the concerns of your citizens, go talk to them in person, not in press conferences or through police captains. Apparently, they have better things to do on a Saturday afternoon. I know one thing — so long as the protests keep moving forward and continue gaining support from fringe groups like these hard-hat wearing dudes, the authorities will have no choice but to cave. It’s just a matter of time. Here’s a photo of my revolutionary family who are there almost every day — mom and baby, courtesy of News.am.